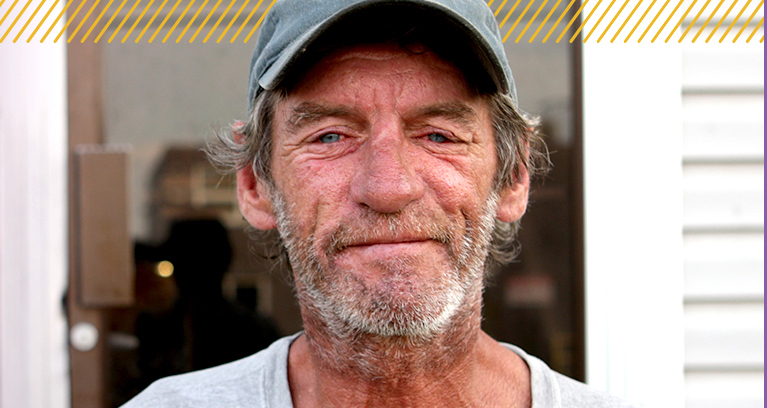 When Russell came to us, he had been sleeping under trees, struggling to find work. After spending a decade stuck in a cycle of addiction and poverty, he knew it was time to make a change. Life had not been easy for Russell. As a child growing up in a family of eight, he recalls getting teased because of his hand-me-downs and for the holes in his clothes. Food was limited, as his dad worked to support six children. As a teen, Russell was incredibly talented at baseball—it was something he could have pursued as a career. But his family just didn’t have the money to support his dream. There was nobody. Just me. One day, Russell saw someone in coveralls heading to work and asked them where he could go to find a job. That’s when he first heard about Bissell Centre. He quickly reached out for help. Although overcoming his addiction wasn’t easy, with Bissell Centre’s help, Russell managed to find and maintain steady work as a landscaper. Today, he still works for the same company after nine years of employment. Not only did a steady income give Russell the confidence to sustain a livelihood, the housing program helped him to find a home and a family. “I know when I’m coming home, I’m coming home,” shares Russell. He is so grateful to have security and to be leading a dignified life—a life of growth and transformation that he hopes can spread to others who are struggling. As the season of gratitude approaches, Russell looks forward to sharing his gratitude at Bissell Centre’s Thanksgiving dinner. He reminisces about how wonderful it was to be a part of something when he was feeling alone. “Everything looked so perfect—from the cloths on the tables to the flowers in the pots,” he says. “It was so well organized and well done.” It is these meals that are often the first steps towards growth and transformation for those who are struggling. Like Russell, we are so incredibly grateful for your gifts that have supported so many people throughout the years. Thank you for supporting our programs that have done so much for our Edmonton community!